Home >Blog >Funding >mHealth Impact at Scale – What Does it Actually Cost? The question “what does the health system need the most?” is extremely difficult to answer, so I replace it with an easier question – “how do we make programs with proven impact more cost-effective, so that we can better address and fund health system needs?” And this is the exact question VillageReach recently set out to answer with our study Scale Matters: A Cost-Outcome Analysis of an m-Health Intervention in Malawi. A toll-free hotline provides clients with information and advice on reproductive, maternal and child health issues and refers callers for further care at a village clinic, health center, or hospital. A “tips and reminders” mobile messaging service provides regular text or voice messages on reproductive, maternal, and newborn health topics, tailored to the client’s week of pregnancy or a child’s age. We know CCPF contributes to statistically significant improvements in maternal and child health, but the question that all programs at this stage have to ask is – is it affordable? And if yes, can we make it even more affordable? One way to look at cost is to determine how much the program costs per client. For example, CCPF can be accessed through multiple modes of contact: calling the hotline, receiving text or voice messages on their mobile phones, or accessing voice messages by calling an automated interactive voice response (IVR) system. To determine CCPF’s “cost per contact” we took financial data from the project pilot and divided the cost by number of contacts – US$4.33 per successful contact with CCPF or US$29.33 per user (since most users contact CCPF more than once). Another way to look at cost is to determine the costs per benefit that comes from the service. For example, how much does CCPF cost per additional child who sleeps under a mosquito net as a result of using CCPF? Or how much does it cost per woman who starts prenatal care in her first trimester? Looking at it this way, we determined that CCPF costs between $67 and $355 per positive outcome. Indicators where CCPF had a large impact were more cost effective than indicators with smaller impacts (i.e. women using CCPF were 80% more likely to know that a child born at home needs to go to a health center immediately than comparable non-users thus the cost per woman experiencing this indicator was only $67 per woman). How can we make it more affordable? In order to understand how to make the program more affordable, we had to consider multiple scenarios. What if we had more users? What if we used only SMS for tips and reminders (as opposed to voice messages and SMS)? What if every message we sent was successful (i.e. we didn’t have to pay for messages that “failed” due to a client’s phone being turned off or bad network). Through this analysis, we determined that increasing the number of users was the best way to reduce cost. In fact, we could reduce costs per user by 48% just by increasing call volume to our hotline. The concept of economies of scale is a critically important lesson for the mHealth community. As an emerging field, mHealth is building an evidence base of its effectiveness at improving health through pilot projects, but has yet to prove itself at scale. Partnerships are important for any program. However, the stage and evidence base of a program often dictates what types of partnerships should be cultivated or explored. 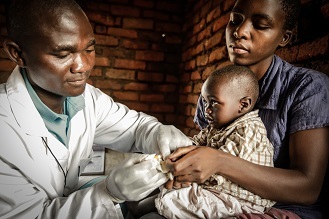 VillageReach has already made significant progress toward reaching economies of scale, and in February 2014, the Reproductive Health Unit of Malawi’s Ministry of Health endorsed CCPF and stated their desire to see the program scale nationally. With the support of the Ministry and its partners, CCPF is now available in eight districts and is expected to double this number in 2016. MNO engagement is also an important element. VillageReach recently entered into a partnership with Airtel, providing benefits to the program that wouldn’t be possible otherwise. Through this partnership, Airtel will provide zero-rated service, expand CCPF’s district coverage and marketing, and broaden its health focus to other maternal and child health related issues, such as nutrition and preventing mother-to-child transmission of HIV.